You could be the best golfer in the world, but if you’re not playing with the right golf ball it could impact your entire game. Many golf players often have the belief that you have to be a single digit handicapper before you can actually play a specific golf ball. 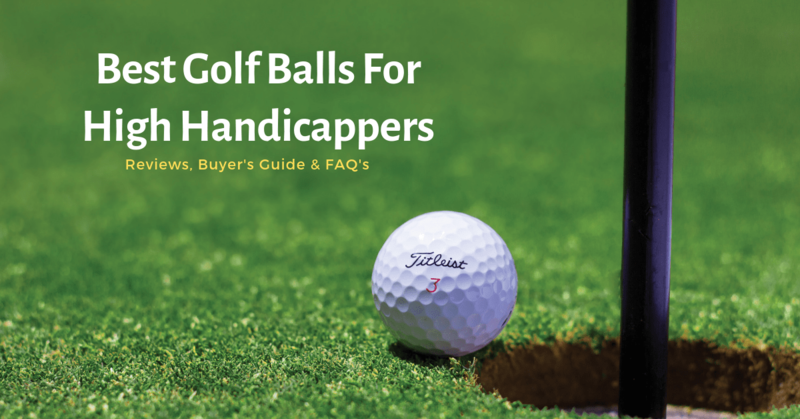 But the reality is that you’ll never get to be a handicap golfer if you don’t understand the basics of the game that includes the right swing, game type, and the best golf balls for high handicappers that fit your requirements. All the big companies make different golf ball types for the various types of swings used by amateur golfers. For example, a more expensive ball that spins a lot on chips might not be the wisest choice for you if you’re losing a sleeve or two around. Therefore, at the end of each golf course argument, the golf balls matter a lot. We have tried to focus on this article, in helping the readers pinpoint the best golf ball for their game. Whether you’re a person who is always competitive at a golf club or someone that just gets out on the weekends, this article will definitely provide you with the information that you need to choose the best golf ball for your game. It becomes important to do your research and find the best golf balls to improve your game. There are plenty of brands to pick from, each one offering something different to suit your golfing style. Before you go all picky and try to select the best-looking golf ball, read the points before purchasing the product so that you can take an informed decision. Picking the right golf ball is a great way to tailor your gear to your playing style and give yourself a little help getting onto the green. You should definitely look at these points and then go select a golf ball that will best suit your game style. Golf balls come in alternative versions that spin slightly less for players who prefer a firmer feel or more control. You should try both types from a range of distances to find your best preference. A harder or firm ball offers the best resilience to your impact, meaning all of the power from the ball is retained for even longer drives. This enhances the power you put in, and will also mean any errors are even more pronounced. On the other hand, a softer ball is more malleable to your club, meaning it helps to absorb any slight errors you might make, offering greater accuracy but it will cost you some power. Urethane covers in the golf balls offer the best spin control and feel but do cost more. There are different layered balls available in the market. A one-piece ball, which has a single layer, is for pure power which makes it ideal as a range ball but unless you’re a pro you’ll want something softer with less spin for a full game. A two-layer ball is a bit more forgiving and can be a good place for a newbie golfer, and so, on adding layers. A three-layer ball is comprised of either a liquid or solid rubber core which makes it soft. It will provide you with more spin and greater control. A four-layer ball has an inner core that allows for an explosive distance, while the next layer transfers energy, helping in flight. It is soft yet durable and usually made from urethane. A five-layer ball works similarly to the three & four layered balls but provides better spin and performance. Therefore, the construction is very important to look for to optimize the game strategy. If you’re really good at your game, you’ll be able to take advantage of a high spin golf ball that will provide you more spins and therefore greater control for maximum drive power. A low spin ball will reduce the spin of the ball, helping it fly through the air for a greater distance. The beginners should try to stick to low spin balls to make sure the shots are straight. Anyone who falls in between those two-skill set will likely be best served with a mid-spin ball that helps to take out the distance from those shots while keeping them on target at the same time. You should definitely take notice of the presence of dimple and the kind of variations between different golf balls. This is a part of the power to control variance. A ball with more dimples will create less drag and your drive. The dimples are created to reduce the surface area of the ball so that it disrupts the air molecules around and it turns flies further. They are not just an aesthetic choice, they are created so that the ball does not reduce its speed because of the air resistance. 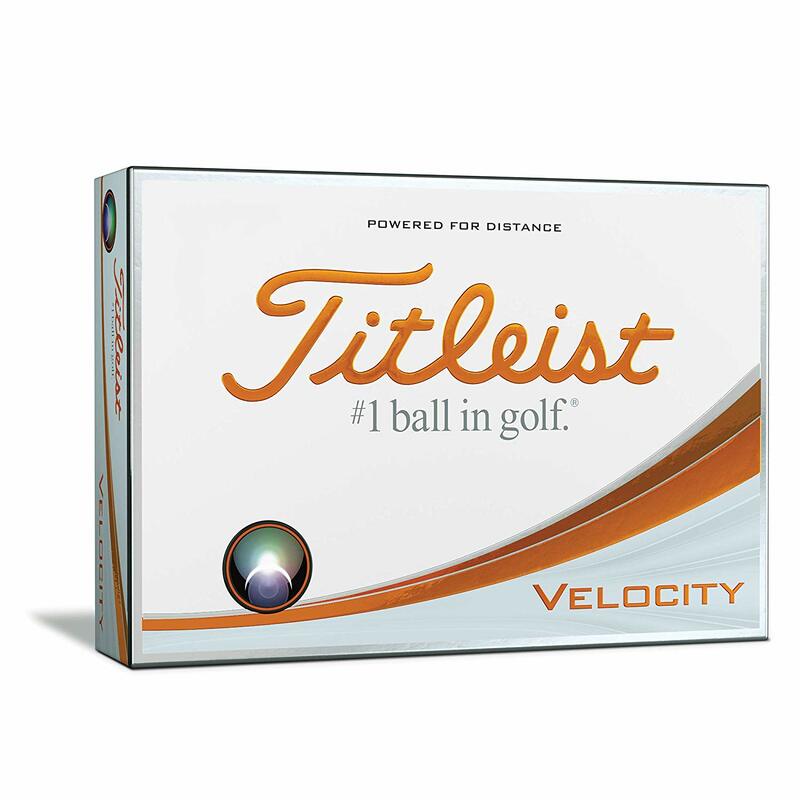 The Titleist Velocity golf ball will definitely top the list of the best golf balls for providing maximum yardage and has been specifically engineered to increase ball speed and to produce a high launch angle and lower spin rate. The golf ball is designed for those golfers who look forward to adding ball speed to their game. The more the speed of the ball, the more distance you cover and therefore, if you’re thinking to add yards to your game, this is the best golf ball available in the market. The ball will surely maximize the launch angle and spin rate because it can translate to an effortless power and lower scores. However, this model will cost you a little extra because with great quality comes a great price. The golf ball is a two-piece golf ball that features a large core, which helps in producing the added speed off of the clubface, thereby generating longer distance. It also has a spherically-tilted 328 tetrahedral dimple design, that is engineered to improve the launch angle and the flight of the golf ball. There is no need to swing really hard to hit the golf ball to go far. You should take care to land this ball short of your target because it will have a lot of rolls. It has a diameter core of 1.575 inches. The better the core, the more distance it covers and is what makes this one of the best golf balls. The ball is made up of a thin NaZ2 Suryln cover, which is also harder and durable than urethane. The Suryln cover is typically used in the construction of golf balls for achieving greater distance due to the efficient energy transfer the cover provides an impact. This golf ball will also feel slightly harder than the premium golf balls like the ProV1 and Pro V1x on and around the greens. It will also give you more yardage off of the tee – plain and simple. If you want more distance and high ball flight, this is the best golf ball for you. 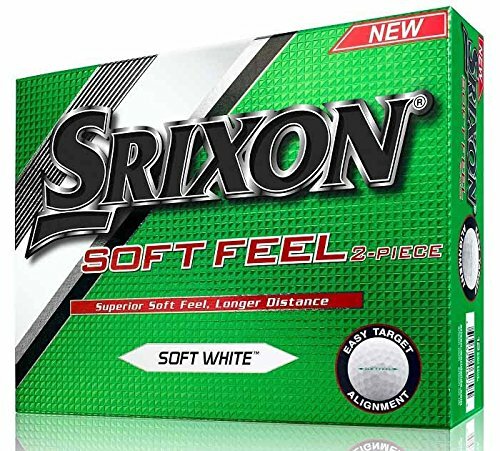 The Srixon Soft Feel Golf Ball is specially designed for the high handicap golfer who wants a soft feeling golf ball at an affordable price. This ball has been made keeping in mind that there are many golfers who don’t have time to spend thousands of hours on the range and so simple golf balls are a better option. It is designed to produce a slightly higher launch angle and a reduced spin rate. The Srixon Soft Feel golf ball makes finding the short grass much easier while providing an extremely soft feel. The ball is a distance ball through and through and has a compression level of 71, that is four points lower than the Srixon Q-Star premium golf ball designed for more advanced players. A compression core of 71 which is means that it will fly super far. The lower compression rate provides a softer feel while preserving distance gains. The golf ball will be a great match for those of you who naturally have slower swing speeds. A high compression means that the golf ball will back up on the greens, but it will lose a lot of energy in the process and that is what the model does not want to achieve. In addition to efficiently transferring impact energy, the Srixon Soft Feel also produces a high launch angle, resulting in increased yardage on all shots. The ball is a two-piece golf ball with an Energetic Gradient Growth core that is engineered to promote increased acceleration and longer distances. It also features an outer layer, or cover, made from Ionomer, which is softer than most of the conventional outer layers and is available in Pure White and Tour Yellow for those golfers who like high visibility balls. The Ionomer cover is also thinner than previous versions of the Soft Feel and is meant to add a bit of bite around the greens so that you don’t totally sacrifice responsiveness for distance. The golf ball is designed with the weekend golfer in mind and the price is also right. It’s one of the best golf balls for the money and definitely worth checking out. 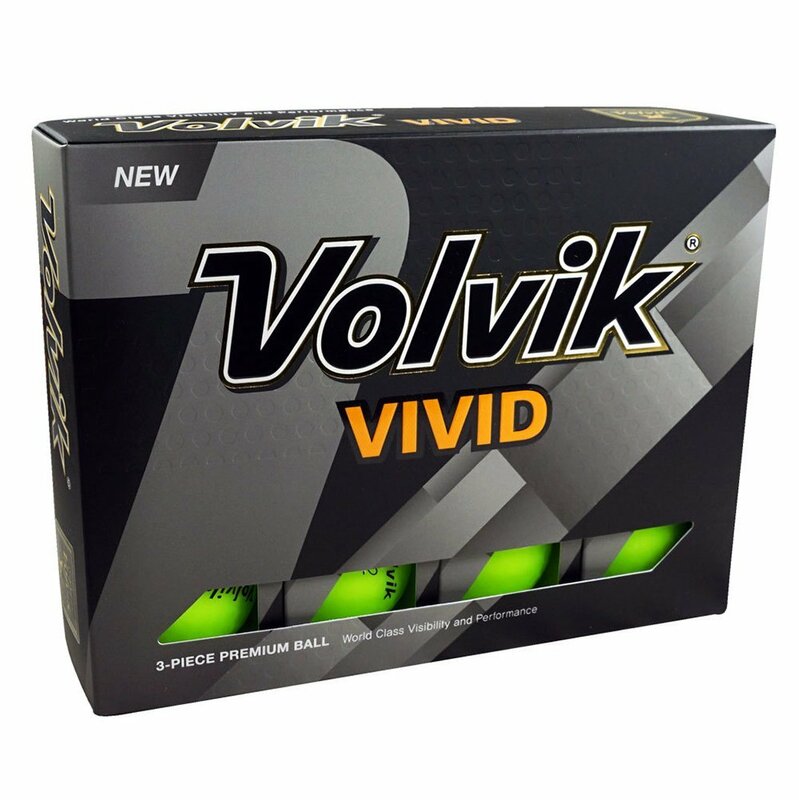 The Volvik Vivid Golf ball is a straighter, more consistent and has an extremely Soft Feel. This golf ball is unique in the fact that it combines Volvik’s neon colors with an amazing matte finish plus all the amazing performance of our Crystal golf ball. The ball is completed with by a Matte finish outer layer as mentioned above, that gives it a more stylish look to complete off your fashion game. The ball can cover explosive distance for those golfers who tend to have a slower to medium swing speeds. It is created by the power core that provides super distance coverage. The ball has an improved accuracy off the tee and increased control around the greens & not to forget, enhanced flight optimal spin rates around the green that in turn also provide ‘stop and spin’ control. The ball also has a more accurate aiming by distinct putting line. The golf ball is a 3-piece, 80 compression ball that has been tested as one of the longest golf balls on the market, especially for slower to medium swing speeds. The VIVID is claimed to be the first matte finish golf ball that really makes the golf ball stand out in the air and on the ground. The matte finish increases visibility and speed of play while making course management and ball striking better due to enhanced awareness of where your golf ball is located. Therefore, you should definitely put this option in your buying list to give it a try at least once in your gaming lifespan. 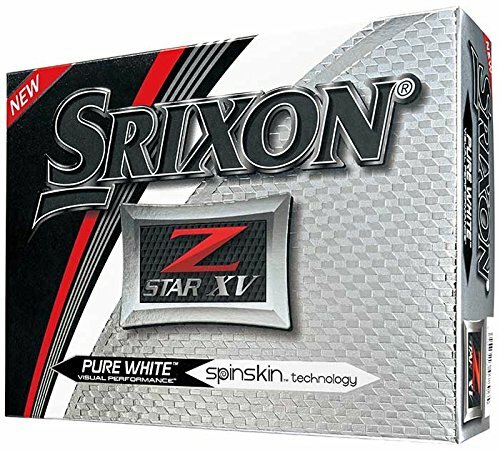 The Srixon Z Star XV golf ball is a premium ball designed for elite players who are on a budget looking for more distance through increased ball speed and penetrating ball flight. If you want to add yards without sacrificing meaningful spin, the Z Star XV could be the best golf ball for you right now. The ball is a four-piece golf ball featuring dual energetic gradient growth core, which provides the added distance. It is also optimally designed 338-speed dimple pattern that helps in reducing drag. The inner core is larger and softer while the outer core is harder and thinner, which allows for maximum distance on all shots. The ball is long and if we are to compare, it is a few yards longer off the tee than the Srixon Z Star. The ball feels pure when struck solidly from the fairway and doesn’t take away from the playability of the golf ball. The Z Star XV has a urethane cover and plenty of feel on wedges, pitches, and chips. It also has plenty of spin around the greens due to Srixon’s SpinSkin technology that helps in providing a more consistent spin rate around the greens. This premium golf ball will provide you with everything that you need without breaking the bank. 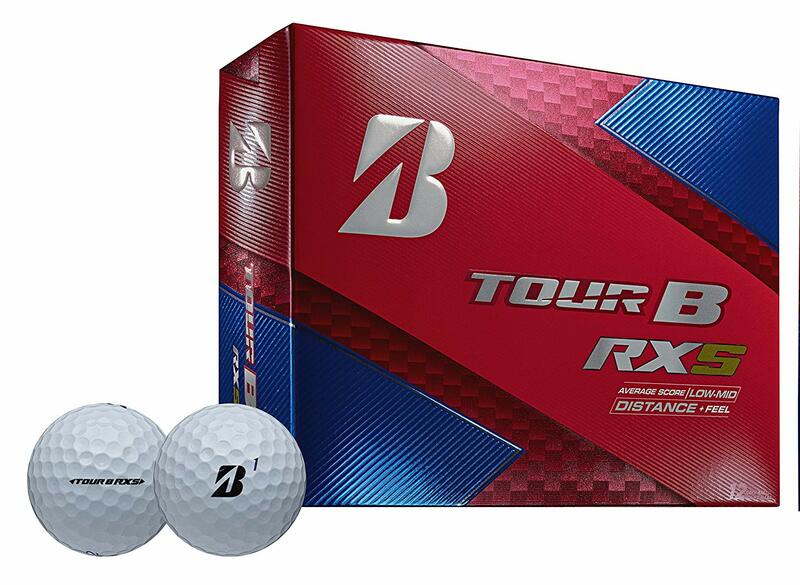 The Bridgestone Tour B RXS is a ball that is specially made for mid-low handicap golfers who are looking for increased distance in a premium golf ball, but who also love soft feel. This golf ball features a very low compression rating at 64 making it the easiest golf ball to compress in the Bridgestone Tour B line and will add yards to your game without feeling very hard and clicky. It also features a Gradational Compression Core that produces extremely fast initial ball speeds that lead to maximum distance off of the tee, while also decreasing side spin to enhance accuracy. The golf ball has the same slipres cover and has been engineered to have soft feel due to the urethane cover and in part due to the golf ball’s mantle and core. The ball also has the same dual dimple design as the rest of the Tour B line of golf balls, that is meant to reduce drag and increase distance. The Tour B RXS is a technology-packed golf ball that can compete with the best golf balls currently on the market and if you are seeking maximum distance combined with a soft feel, then this model is, without a doubt the ball for you. 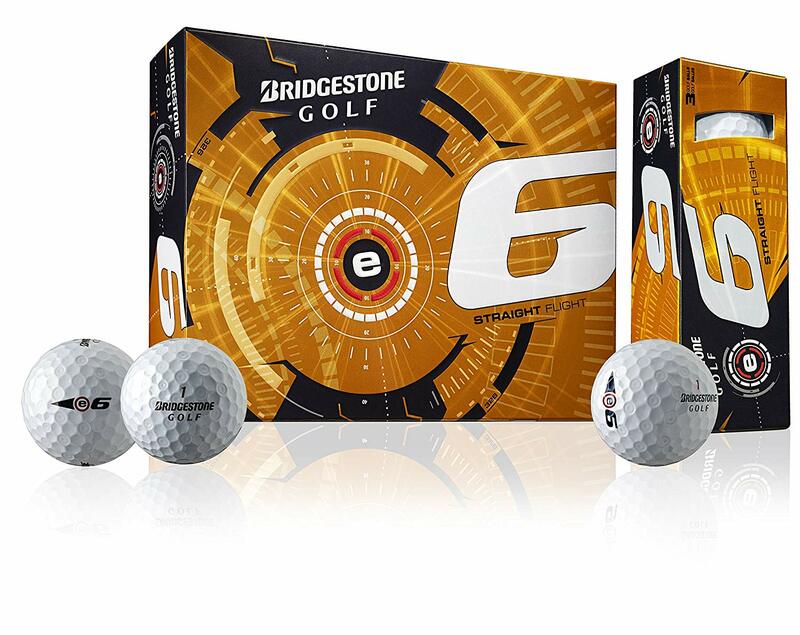 The Bridgestone e6 golf ball is the softest multilayer golf ball currently on the market. The e6 has a core compression rating of 50, which is quite soft on the softness spectrum and are likely best suited for golfers with slow-to-average swing speeds of around 80-100 miles per hour. That will, in turn, help them compress the ball with irons and maximize distance. The ball is a three-piece construction, consisting of a surlyn cover, soft gradational core and anti-spin mantle. The inner layer resists sidespin and therefore results in shots that are much straighter. The soft surlyn cover on the ball provides durability and low spin. The ball also offers a 326 “dual-dimple” design, with Bridgestone’s “WEB Dimple Technology” that provides increased surface coverage and also increases lift, reduce drag and increase ball speeds with all clubs for a better and longer ball flight. With the putter and shorter clubs, the impact sound is very muted and low pitched as you would expect for a relative softball, but then again it is a bit surprising given the surlyn cover. The addition of driver and other longer clubs, the ball feels firm and hot off the face, that gives a great impact feel. However, with wedges, the e6 leaves a little something to be desired in terms of spin. If you’re someone who tends to fight a slice or a hook, there’s a very good chance of improving or nearly eliminating the issue entirely with the e6 ball. 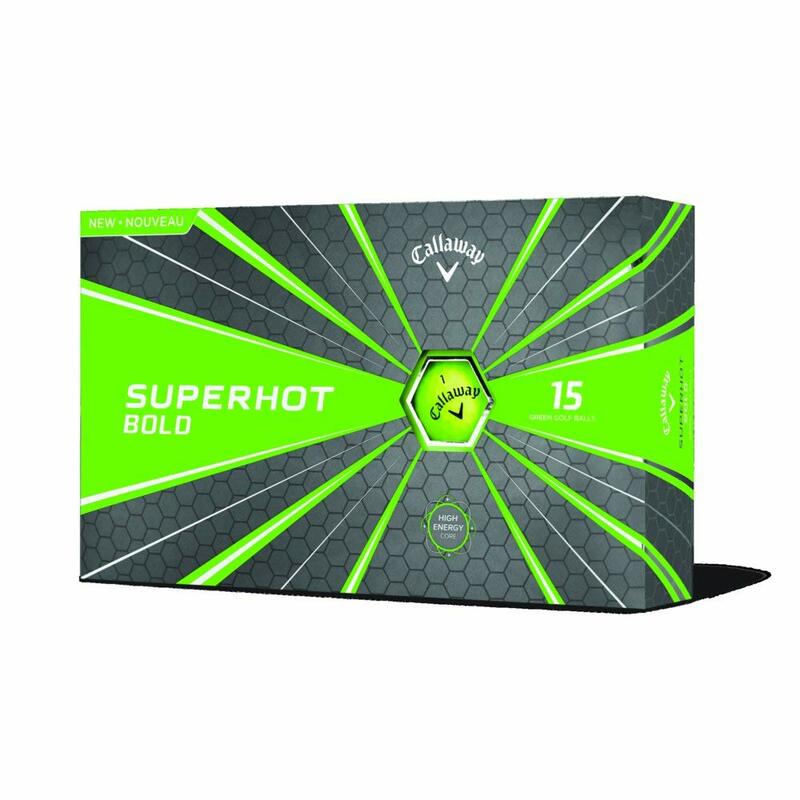 The Callaway golf balls stand out when teeing up with a Superhot Bold, and they all relate to the cover. These balls might feel a bit tackier than most to quite a few people out there, as compared to other matte finished options. With these balls it often seems like they pick up more dirt than a white ball did that was also in play and still manage to show negligible signs of any deterioration or bruising, making the Superhot Bold a durable golf ball. The golf ball provides good flight that also is high, which aides not only in picking up some extra yardage but also makes sure that the ball would hold a green. This ball feels easy to compress, and on good swings, gives a soft and responsive feel. It is a 3-piece construction and also has a softer cover. While the matte orange, red, and yellow might take some time for players to get used to, the performance is one that will surely be a comfortable addition to the bag. The TaylorMade Project golf ball is one of the best golf ball options for mid-level golfers who are looking for more spin around the greens. It is great, both in terms of price and performance and also features a low compression core. The low compression rate of 70 is meant to help out golfers with swing speeds below 100 mph. The lower the compression rating, the more distance you will get out of the ball. This golf ball will definitely maintain high spin rates around the greens. The ball, though, is not meant for high-handicap beginners as the spin produced by the urethane cover and mantle will cause the ball to slice or hook if not hit properly. This golf ball was created for good golfers looking to play more than a simple distance ball. It is a three-piece golf ball with a low compression core, mantle, and high-performance urethane cover. It will move from right to left and vice versa when hit properly and will check on the greens. 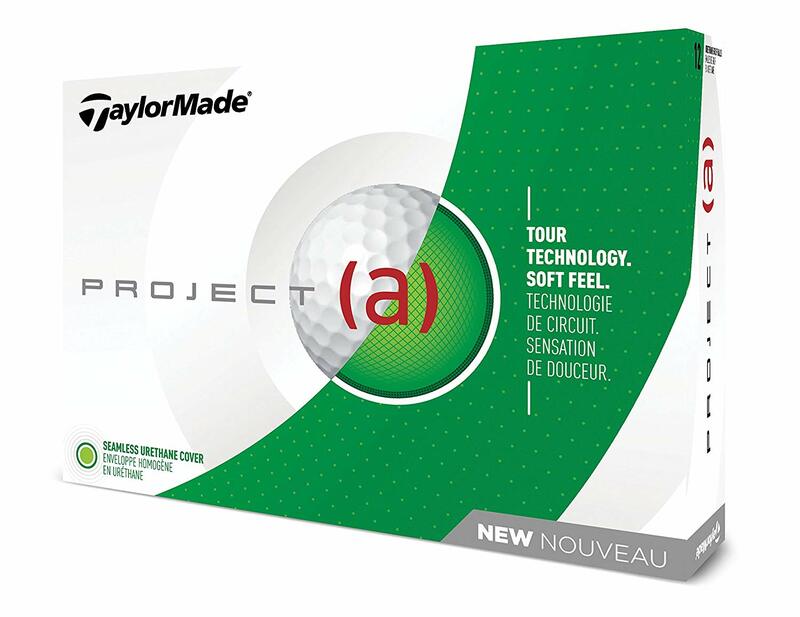 The TaylorMade Project has a price point that is a bit higher than some of the other best golf balls for amateurs, meaning that TaylorMade has jammed more technology into this golf ball than others. And, more tech means more performance. The ball features a high-performance thin urethane cover, meaning more spin and a softer feel. This material is sticky and soft and creates great reaction around the greens. The tech of the golf ball makes it react just like a tour ball around the greens. In a nutshell, it’s one of the best golf balls for overall performance. The Srixon Q star golf ball has one of the best performances in the market when it comes to feel, length, and control. The ball has almost a forgiveness to it on slightly off-center hits and gets in the air effortlessly. It is tuned to increase distance on the driver while providing unparalleled stopping power on approach shots. The ball is also designed to produce an aggressive ball flight that maximizes distance regardless of weather conditions. High ball speed is maintained for a longer period of time during the flight. The ball is developed to maximize the energy transfer to the ball for more ball speed resulting in greater distance and is configured to provide great touch and feel greenside. In addition to the features already mentioned, the ball is responsive on full shots that need to be shaped. The model comes in pure white and tours yellow patterns. They are “all ability” balls with an improved version of Srixon’s 324 “speed dimple” pattern, and is appropriate for all golfers with swing speeds over 75 mph. Its design focus is on distance and control, buts the SpinSkin cover is intended to add more greenside spin. The Q-Star ball has a mid- to low driver launch angle with a compression rating of 77. 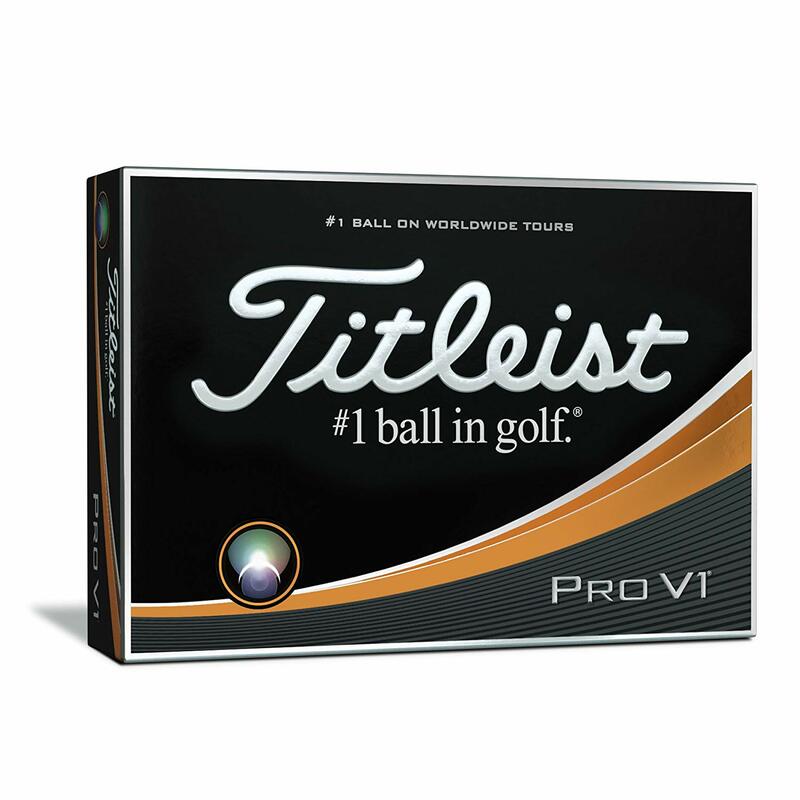 The Titleist Pro V1 needs no introduction and is meant to be the softer feeling of the two versions. It is a three-piece construction with 352 dimples arranged in a spherically-tiled tetrahedral design. The Titleist Pro V1 golf ball is technically geared toward advanced players and has been built to shape shots and react with lots of spins. The ball spins less, has a harder cover, and is more durable that should appeal to the amateur golfer. Lower spin rates lead to distance gains and players report picking up 5-10 yards on drives and a handful of yards with their irons. It has a spherical tetrahedron dimple pattern, meaning that the golf ball will have a little more pop off of the club face and will be a little more “clicky” on the putter. The ball is less soft but also doesn’t feel that hard, it just feels solid. The model has achieved a new design by reengineering the core design. The ball comes with a urethane cover but and has also introduced the Next Generation 2.0 ZG Process Core. Above the core and under the urethane cover sits an ionomeric casing layer that allows it to have a high spin rate on wedges and chip shots. Although the ball spins less, it barely spins less. The ball somehow adds up to 5-10 yards to this ball without sacrificing too much spin. You won’t have as much zip on this ball, but you have plenty of control around the green. The cover is also quite durable for this premium ball. What’s a two-piece golf ball? Two-piece balls have two components: a large, solid core and an external cover. Also known as distance balls, they’re cheap, hard and durable and perform best for slower swing speeds by maximizing distance. They are golf balls that know when to spin, depending on which club has hit them. For instance, they become low-spin balls with the driver and long irons, to max out ball speed and distance. Then when the shorter irons and wedges come out, they spin like a campaigning politician for increased grip and control on the greens. Do extra layers make any difference? Three-layer balls were the first multilayer golf balls but four, five and even six-layer balls are also available. Each additional layer aids a more even progression of spin rates and performance through the bag. Extra layers can often mean a ball performs better with mid irons. 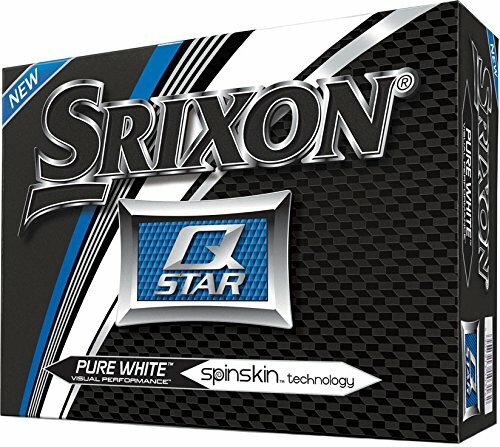 How do I decide the best ball for my game? If you’re a beginner, start off cheap because it’s likely you’ll be losing a few balls along the journey. Two-piece distance balls will give good distance and run and reduce the effects of a hook or slice. If you are a low to mid handicapper, you’ll probably be more suited by a multilayer golf ball. Try a few different balls to decide which spin and compression combination feels best – you’ll get a good idea which one is perfect for you after a few holes. Now that we have discussed the best golf balls for high handicappers in the market right now and reviewed them as per the requirements, you can go ahead and choose the best-suited ball for your next game. You cannot go wrong with any of the options mentioned above. The only thing you need to do now is to narrow down the requirement and then select the golf ball that will best suit your desires.